Simply put if you intend to use Adwords, some type of social media or even an email marketing campaign to capture leads the page the customer lands on must convert. Essentially, it needs to stand out and leave no doubt in the potential customers mind that they have come to the best possible website for their search. This landing page needs to have some serious impact and hit the user right between the eyes with your message. This is especially the case with Adwords where each cost per click can be really expensive. Basically, the money you spend getting the person to get to your page must be well worth it. Poor landing pages are a waste of money and time. Given the competition online and the cost per lead acquisition nowadays, your landing page MUST be better than the competition. When I say conversion this could mean many things; from phoning your up, sending an email, downloading a form, signing up to a newsletter or webinar, basically it’s what your intention or online goals are. Most businesses we deal with want their landing mages to either capture leads through and email or for the customer to call. 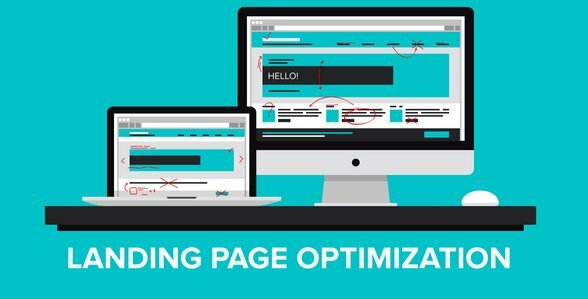 Following are what we feel are the most important points that go into designing a killer landing page that converts. A landing page is like no other page on your website. In fact it should be considered a unique page; one that’s trying to communicate 1 simple message or sell 1 product. It must not be cluttered with too much information about everything you have to offer. The message has to be succinct and to the point. Once the potential lead lands on your page the message they read has to leave them with no unanswered questions. Why? Because they have landed on your page from a Google search and your page must satisfy their query quickly without any fluff, waffle or over designed pages. Keep it simple and too the point. Designing pages like this are best left to professional landing page designers that know how to combine attention grabbing headlines and copy with great visuals for maximum impact – this is the key to landing page optimisation and making the most of the money you spend on your marketing budget. This is a very important component of your online digital strategy so make sure you get it right from the beginning. Why not add a video on your landing page? Nothing sells harder and has more online appeal than a well produced 2-3 minute video. If your trying to promote a new product or service and want to really grab the time poor visitors attention, nothing is better than a video. Remember it’s far easier to hit the play button for a person than it is to read 500 words. Plus if the video is professionally filmed, the end result will help improve the chances of the customer calling you. Link this landing page to all your other marketing material. If you have gone to the effort of designing a great looking landing page then the best thing you can do is spread the word out there and push it hard on all your marketing channels. Place the URL link on all your social media pages and if you are sending email newsletters out to clients add the link in this newsletter that will direct people to this new exciting page. All they need to do is press click and they will see your new wonderful landing page. The aim of this landing page is multi purpose. It needs to fit comfortably on all your sales and marketing platforms so all the user has to do is hit the button and they arrive at where you want them to be. Think about your Facebook ad campaign. Like with Google Adwords it must have the same impact and you need to produce the same type of result. That is, clear sales funnel that leads the buyer straight to where you want them to be. The real beauty of landing pages is that they are totally separate from your website and can be used as a seriously powerful sales and marketing tool. Thinks about it. Imagine you had a service or product that you really wanted to push online without driving people to your larger main website where chances are they might get lost among all the other information. This is where landing pages step in and this is why they are really good at promoting a single point. A company like ours; Hopping Mad Designs can design and build you a landing page that’s geared for serious conversion. we have the design experience and pool of talented writers and designers that can coordinate everything to bring you a landing page that put simply rocks!